Offkey, formerly known as JERMZ dedicated to be the medium for local and regional artists to promote their work to a potentially wider audience, is proud to present three of Southeast Asia’s post-rock powerhouses across Indonesia, Malaysia and Singapore this 3rd of January at Aliwal Arts Centre, Singapore. Echolight are Fariz Halim, Gega Dermawan, Dito Setiasa and Fendy Gustya Suwardana. They were formed in 2006 and are from Bandung, Indonesia. Inspired by the flow of shoegaze, post-punk and post-rock, instrumental music becomes a form of submission and interpretation of their life experiences. They complement their music with different perspectives of life to enrich their musical traits and combining it into one specific human peculiarity called Echolight. 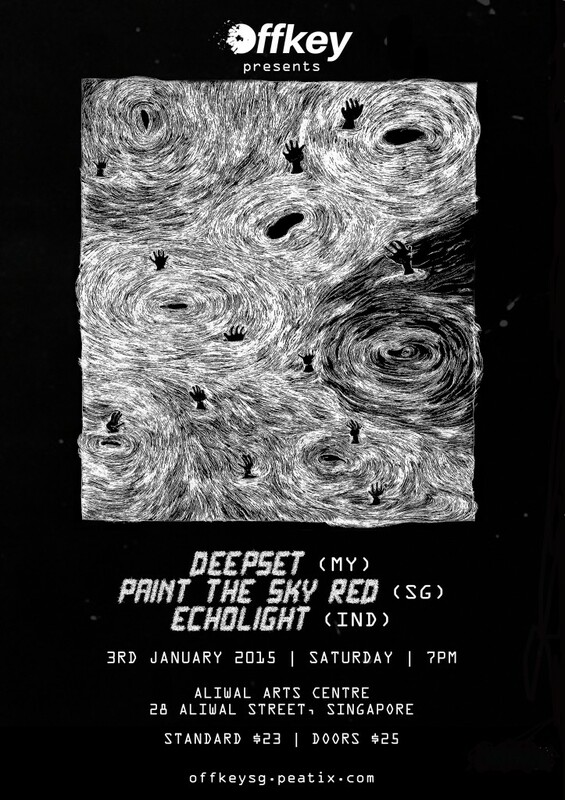 Paint The Sky Red is an independent instrumental rock band from Singapore. The songs we write hope to serve as the soundtrack for one’s own self-reflection to find meaning in tests of time, moments of uncertainty, the nostalgic past, the bitter past, the fragility of life and relationships and struggles in one’s acceptance of fate. They are purely instrumental with wordless words for listeners to envelop and express with their own interpretations. Deepset, a quartet from Kuala Lumpur, Malaysia, discovered the trial of composition that has been appropriated by indie rock after being refined over the centuries by harmonic and sonic experimentation. Their birth was in late 2002, where the band pushed the enthuse to produce instrumental piece which as the band believes that music is nothing without inspiration that has an influence.